Not so long ago, a villa conjured an image of living in a resort. Today it still epitomizes that luxury. Lalith Gangadhar Constructions Pvt. 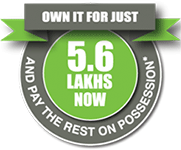 Ltd (LGCL) launched, its first project on November qw, 2008 and today, has redefined the art of living in style. “When we started providing niche homes with all facilities, it actually became a game changer. AN LGCL villa pulls out all the stops on luxury and you don’t have to go to the out skirt for it, We have a presence across the city in prime locations,” says Girish Puravankara, chairman & managing director (CMD), LGCL Group. Featuring high design standards and premium amenities at attractive price points, an LGCL villa lets you feel the luxury and reveal in it. Each of these villas is about experiencing a great sense of space wherein you get to enjoy the sense of space wherein you get to enjoy the grand combo of luxury, quality and workmanship. It is about living a lifestyle that is unlike any other. “With similar luxury specifications across all projects, an LGCL villa guarantees quality across a premium spectrum. The best of marble, wooden flooring – you name it – every details live up to thee same high standards – right down to the designer bathroom fittings. 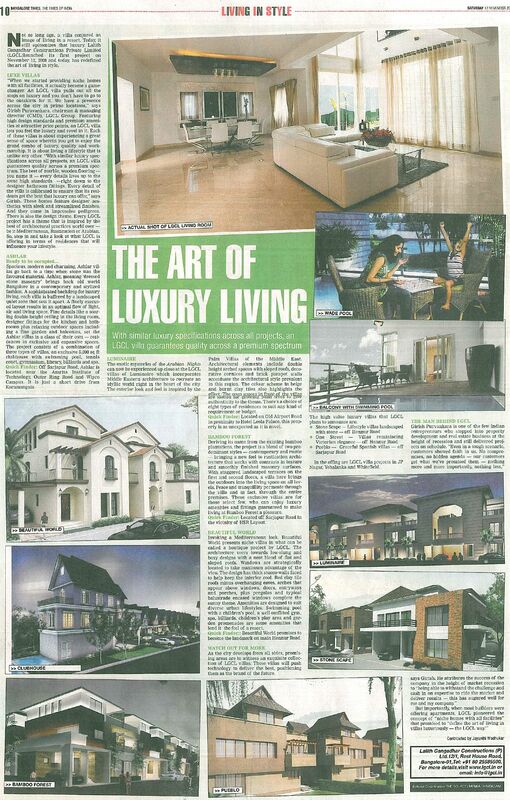 Every details of the villa is calibrated to ensure that its residents get the best that luxury can offer,” says girish. These homes feature designer aesthetics with sleek and streamlined finishes. And they come in impressive pedigrees. There is also the design theme. Every LGCL project has a theme that is inspired by the best of architectural practices work over – be it mediterranean, Rustication or Arabian. So, step in and take a look at what LGCL is offering in terms of residences that will influence your life style. Spacious, modern and charming. Ashlar villas go back to a time. When stone was the favoured material. Ashlar, meaning “dressed stone masonry” brings back old world Bangalore in a contemporary and stylised fashion. A sophisticated backdrop for luxury living, each villa is buffered by landscaped quiet zone that sets it apart. A finely executed layout results in an optimal flow of light, air and living space. Fine details like a souring double height ceiling in the living room, designer fittings for the kitchen and bathrooms plus relaxing outdoor spaces including a fine garden and balconies, set the Ashlar villas in a class of their own – residences in exclusive and expansive spaces. the project consists of a combination of three types of villas, an exclusive 5,000 Sq. ft clubhouse with swimming pool, tennis court, gymnasium, library, billiards and spa. Quick Finder: Off Sarjapur Road, Ashlar is located near the Amirta Institute of Technology. Outer Ring Road and Wipro campus. It is just a short drive from Koramangala. The exotic mysteries of the Arabian Nights can now be experienced up close at the LGCL villas of Luminaire which incorporates Middle Eastern architecture to recreate an idyllic world right in the heart of the city. The exterior look and feel is inspired by the Palm Villas of the Middle East. Architectural elements include double height arched spaces with sloped roofs, decorative cornices and brick parapet walls accentuate the architectural style prevalent in this region. The colour scheme in beige and burnt clay tiles also highlights the effect. 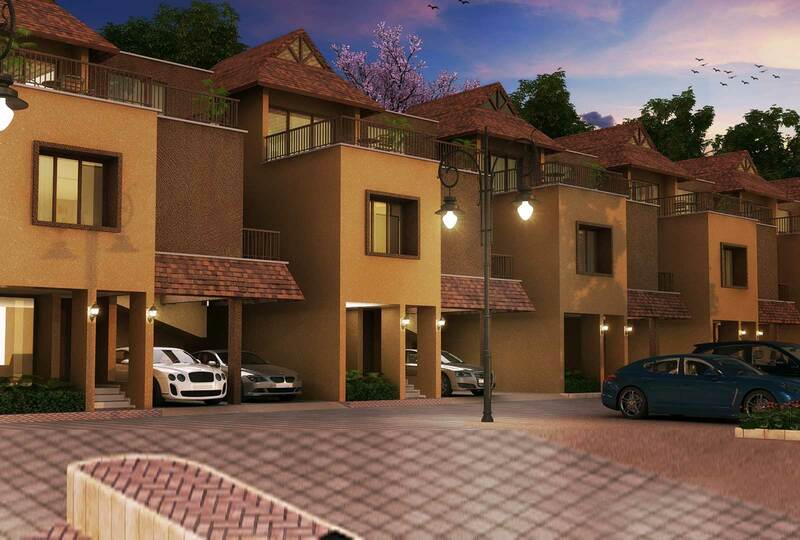 The open spaces in front of the villas are slotted for growing palm trees to give authenticity to the theme. There’s a choice of eight types of residences to suit any kind of requirement or budget. Quick Finder: Located off Sarjapur Road in the Vicinity of HSR Layout. Invoking a Mediterranean look, Beautiful World presents niche villas in what can be called a boutique project by LGCL. The architecture veers towards low-slung and boxy designs with a neat blend of flat and sloped roofs.Windows are strategically located to take maximum advantage of the view. the design has thick stucco-walls faced to help keep the interior cool. Red clay tile roofs minus overhanging eaves, arches that above windows, doors, entryways and porches, plus pergolas and typical balustrade encased windows complete the sunny theme. Amenities are designed to suit diverse urban lifestyles. Swimming pool with a children’s pool, a well-outfitted gym, spa, billiards, children’s play area and garden promenades are some amenities that lend it the feel of a resort. Quick Finder: Beautiful world promises to become the landmark on main Hennur Road. As the city develops from all sides, promising areas are to witness an exquisite collection go LGCL villas. These villas will push technology to deliver the best, positioning them as the brand of the future.